Vinyl and cardboard easel displays are lighter, more rugged, and less expensive than acrylic displays. That’s why we specialize in them. 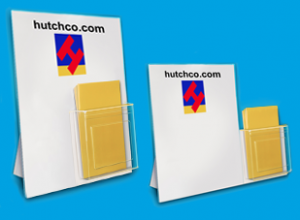 Our team at Hutchco Displays makes every size of tabletop sign holder display you could possibly need, and will always go out of our way to help you. 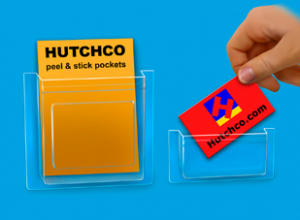 Sherry loves our Peel and Stick Pockets! Hutchco Displays takes pride in providing exceptional customer service to businesses, both large and small. 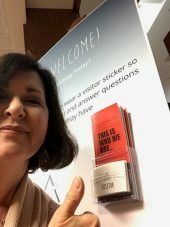 Our promise to you: Customer satisfaction, same-day shipping, and the lowest prices you’ll find for countertop sign holders and brochure holder display products. That’s Hutchco quality. Sherry loves our 11 x 17 easel back sign holders too AND our plastic sign holders too! Save your money by purchasing durable products that you won’t have to continue replacing because they crack or break. To learn more about Sherry and how she uses our products, you can read more. Now Priced 50% LESS than acrylic sign displays! 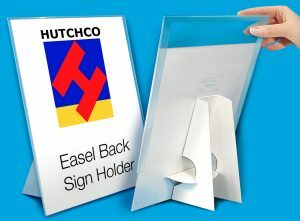 Start saving money today with our Unbreakable Insert-Style Counter Cards (Easel Back Sign Holders). Order your affordable displays for all trade show events, posters & retail signage. Same Day Shipping.